Important: There are two Rosen Properties located on International Drive. The Rosen Plaza is located directly across from Pointe Orlando. Airport transportation options include taxi, shuttle, and rental car. One-way taxi fare from the airport to the Rosen Plaza Hotel will be approximately $45. There are at least two shuttle options for transportation to the Rosen Plaza Hotel and information about Town and Country Shuttle and Mears Shuttle is available on the hotel’s website at http://www.rosenplaza.com/location-and-transportation/airport-shuttles/. Travel time is 20 to 30 minutes between the airport and the hotel. Note that there are two Rosen hotels located on International Drive and the AMTE Conference is at the Rosen Plaza Hotel across from Pointe Orlando. With Town and Country Shuttle, the Rosen Plaza Hotel is often the first drop-off stop when leaving the airport and often the last pick-up stop when going to the airport. There is a discounted rate for reservations that are made more than 24 hours in advance. Click to view map on Google Maps. Follow signs to Orlando Attractions. Take the Beachline Expressway (528 West)-Right. The last exit is International Drive (Exit # 1); make a right turn at the bottom of the exit. 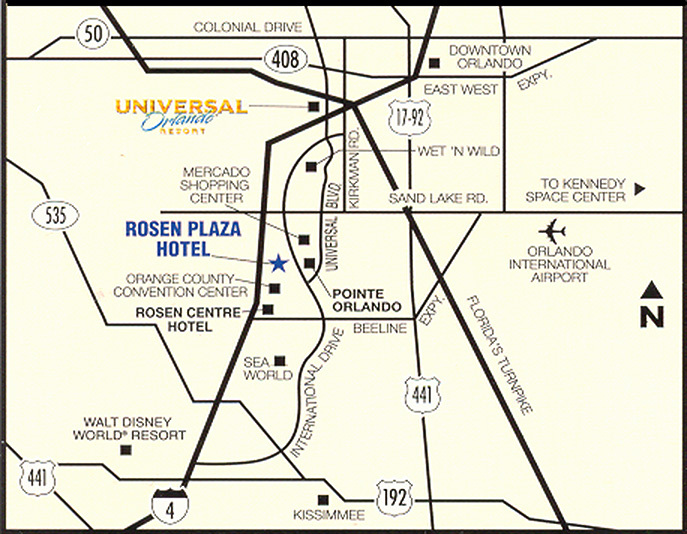 The Rosen Plaza Hotel is located approximately one mile on the left. Take 1-4 West. Exit at Sand Lake Road (Exit # 74A). Turn left at the light. Go to International Drive (second light) and turn right. The Rosen Plaza Hotel is located on your right, approximately one and a half miles. Take 1-4 East. Exit Beachline Expressway (528 East). Take the International Drive Exit (Exit #1). Turn right onto International Drive. The Rosen Plaza is located on the left, approximately one mile. Take the Florida Turnpike to 1-4 West (Exit # 259). Go west on 1-4 and exit at Sand Lake Road (Exit #74A). Turn left at light onto Sand Lake Road. Go to International Drive (second light) turn right. 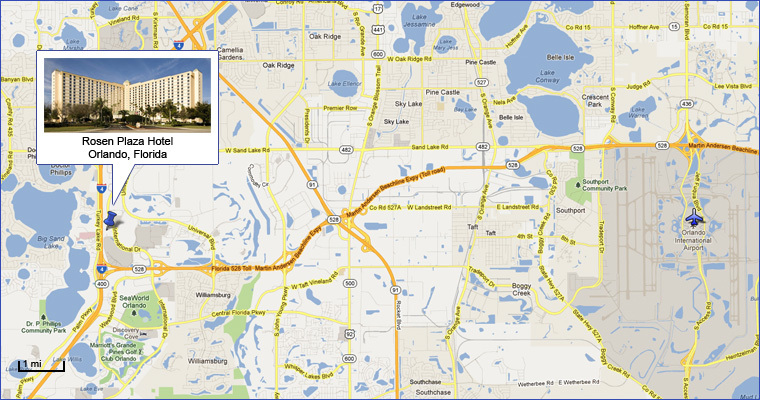 The Rosen Plaza Hotel is located on the right, approximately one and a half miles.